Weighty Matters: Pepsi Refresh adapts Big Tobacco marketing playbook for the 21st century. Pepsi Refresh adapts Big Tobacco marketing playbook for the 21st century. Have you heard about Pepsi Refresh? If not, I promise you will, probably from your friends. Pepsi Refresh is Pepsi's latest brilliant marketing campaign. The premise is simple. Each month for a year consumers will be asked to submit and vote for Pepsi funded grants ranging from $5,000 to $250,000 in one of six areas: Health, arts and culture, food and shelter, the planet, neighborhoods and education. 1,000 applications are accepted monthly and applicants use their own social networks to rally for votes. Each month Pepsi will fund up to 32 projects and they estimate that over the course of the year they'll give out in the neighborhood of $20 million to "refresh everything". So what's in it for Pepsi? Public sentiment and trust. Effectively this is a one year legitimacy campaign with the aim of creating deep and meaningful positive connections with consumers in some of the very areas that Pepsi has run into difficulty - health (obesity), food and shelter (junk food), the planet (factories, waste and plastic), and education (obesity). Ultimately Pepsi Refresh is an extremely cost effective public relations and framing tool geared to position Pepsi as part of the solution and not as part of the problem, a play perhaps learned from the experiences of Big Tobacco. In Brownell and Warner's fantastic paper, "The Perils of Ignoring History: Big Tobacco Played Dirty and Millions Died. How Similar Is Big Food?" they lay out the playbook of Big Tobacco in their handling of the news that smoking was really, really bad for you. "We accept an interest in people’s health as a basic responsibility, paramount to every other consideration in our business." "We always have and always will cooperate closely with those whose task it is to safeguard the public’s health"
Flash forward to 2010 and here's Pepsi doing the very same thing but this time with the harnessed power of social networking. "a charade, the first step in a concerted, half-century-long campaign to mislead Americans about the catastrophic effects of smoking and to avoid public policy that might damage sales"
"The industry wanted desperately to prevent, or at least delay, shifts in public opinion that would permit a barrage of legislative, regulatory, and legal actions that would erode sales and profits." And what are Pepsi's concerns? Schools are banning the sales of their products, governments are considering soda and junk food taxes, banning advertisements targeting children, and creating more transparent food labeling laws, while the public is growing more and more concerned about the impact of obesity on their future and that of their loved ones. Pepsi is taking the Big Tobacco playbook and giving it some 21st century polish. And it's not just their Pepsi Refresh project. In February Pepsi teamed up with Yale University's Faculty of Medicine to open a research laboratory to fund the development of, "healthier food and beverage products" as well establish a fellowship to Yale's MD/PhD program to fund work on nutritional research. This led Michele Simon, public health lawyer and author of Appetite for Profit (the book and the blog) to quip about returning her Yale law degree. "When a business gets its name worked into the academic fabric of a school, it is buying something more than a place to slap a corporate insignia. There is the implication that the firm is a partner in the intellectual enterprise." Pepsi wants you to believe that they're part of the team trying to find the solution, not the team fueling the problem. Never mind that they're spending $30 million rebranding Gatorade to snag teenage athletes, never mind the $5 million they spent in 2009 lobbying the American government to help stymie progressive food marketing, or the $6.7 million they spent in 2009 lobbying the government to support their stances on school nutrition, or the nearly $7 million they spent in 2009 lobbying against soda taxes - they're the good guys, just look at what they're doing with Pepsi Refresh. More depressing still? I've had high school friends and blogging buddies, including physicians and researchers, send me links on Facebook and Twitter encouraging me to vote for the Pepsi Refresh projects they felt worthwhile. If they can't see through this Big Tobacco'esque smoke screen, who will? Ultimately Pepsi Refresh is meant to refresh Pepsi's image. If Pepsi can sway the court of public opinion to think they're the good guys, that gives them clout politically. How? Politicians, expect perhaps New York's politicians, tend not to push issues where they don't have public support. Much tougher to garner public support for practices that might impact negatively on Pepsi when what the public remembers is that Pepsi offered to fund little Timmy's classroom computers, or a $250,000 program to help combat childhood obesity. With 1,000 different grant applications a month that means there are 1,000s of folks each month all harnessing the power of their own personal social networks to spread the word that Pepsi's a wonderful company. Brilliant. The stuff of I'm sure many future case studies in advertising textbooks. I know that the Big Food apologists out there will argue that it's sour grapes that makes me be so negative. Why not take money from Pepsi to do good? What harm is there? How many years did Big Tobacco manage to continue to pull the wool over people's eyes and minimize the negative impact of their products? How many deaths are attributable to their stall tactics? Obesity is now the number one preventable cause of death and my hope would have been that at the very least those who should know better would feel it just as anathema to stump for Pepsi funding community altruism as they would feel stumping for Philip Morris. I don't think junk food can, or should be banned, but that doesn't mean that people should feel comfortable getting into bed with Big Food. Philip Morris is still allowed to sell cigarettes, but at least no one in their right mind would touch them with a ten foot pole for research fellowships, University chairs, hospital wings, health conference sponsorships or funding their children's school's computer room. I can only hope that one day the same will be true of the purveyors of junk food. 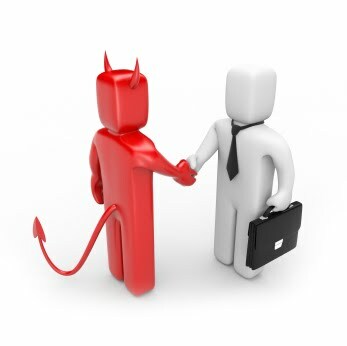 Deals with the devil always have consequences.